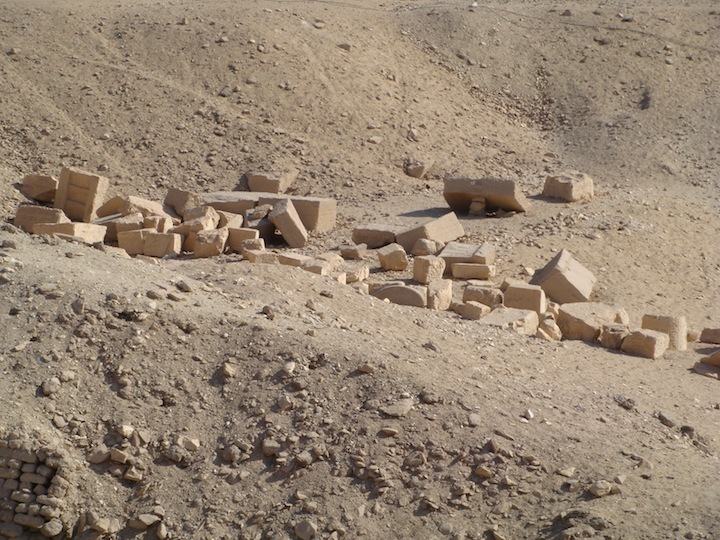 Today I explored the East Asasif and found many tomb sites that I have not seen before and one in particular at the side of Sheshonq Temple that I have no knowledge of. 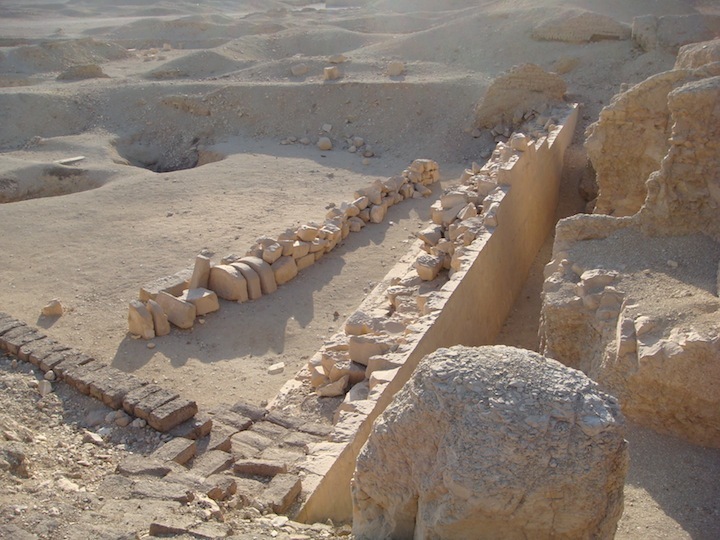 I spoke to a guardian and asked about the long wall that is at the side of this temple, he said it is the Panorama View from Karnak to Hatshepsut. 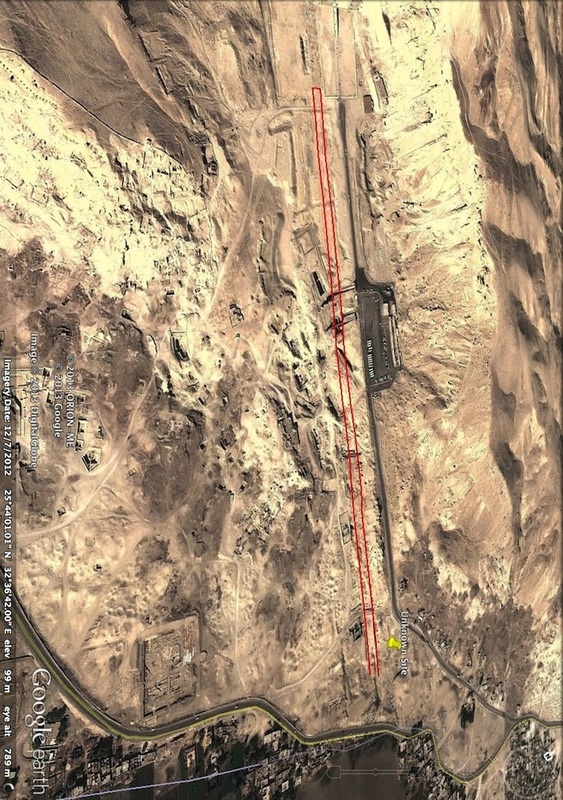 Well, I think what he possibly meant was that it is a Processional Causeway that leads from the Nile opposite Karnak Temple and leads all the way to Hatshepsut. You can make out this possible rout on the map provided. 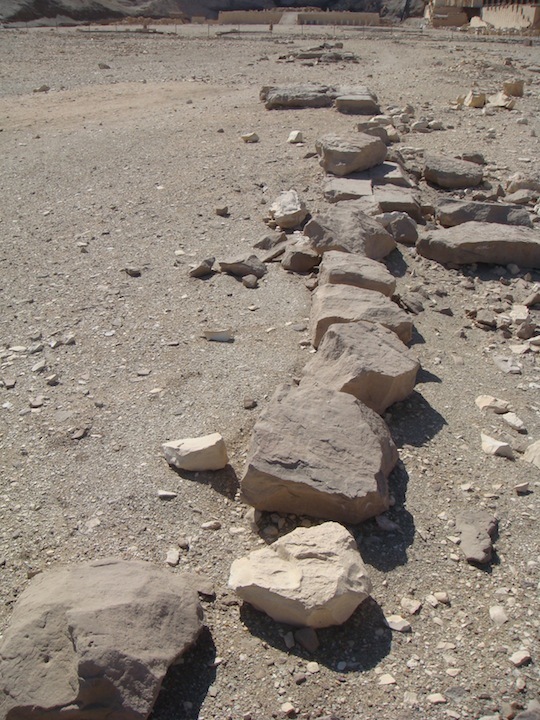 I walked along the rout towards Hatshepsut and could clearly see the stone lines of a causeway. It was made up of very dark brown ancient stone blocks that stood out apart from all the surrounding stones, rocks and debris. 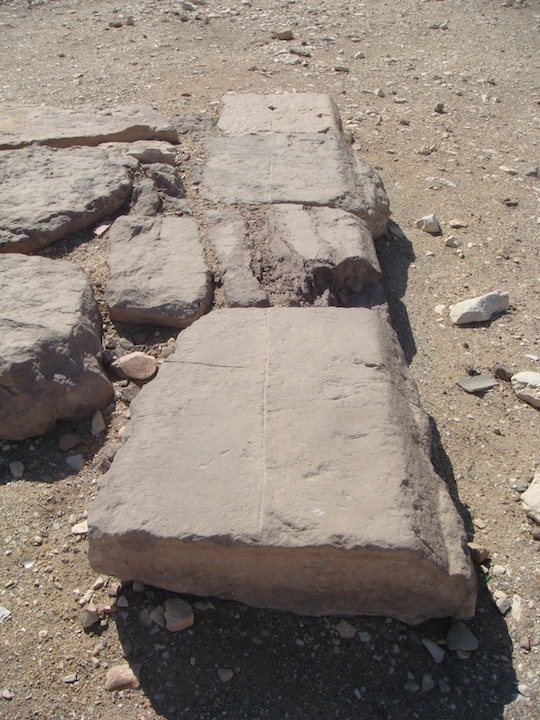 There was a distinctive mark on many of the stones, a distinct line carved in the stone blocks. 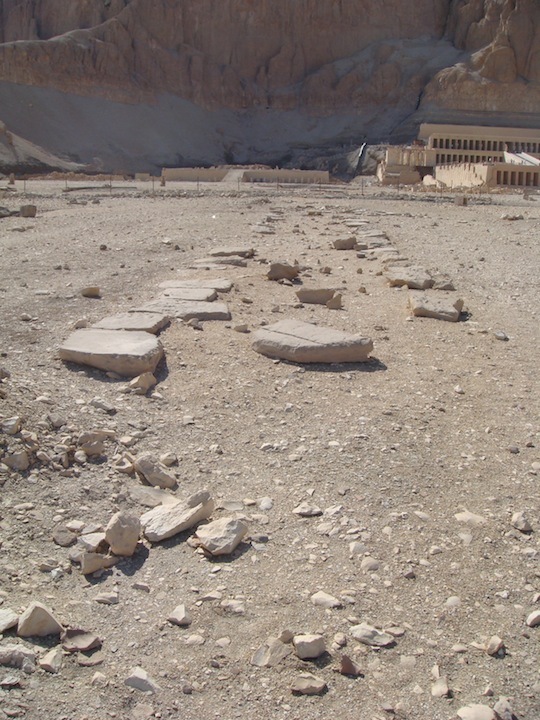 If indeed this is a causeway, then it pre-dates earlier site areas and tombs that now intersect it. I would be pleased to hear from any of you with ideas on this. 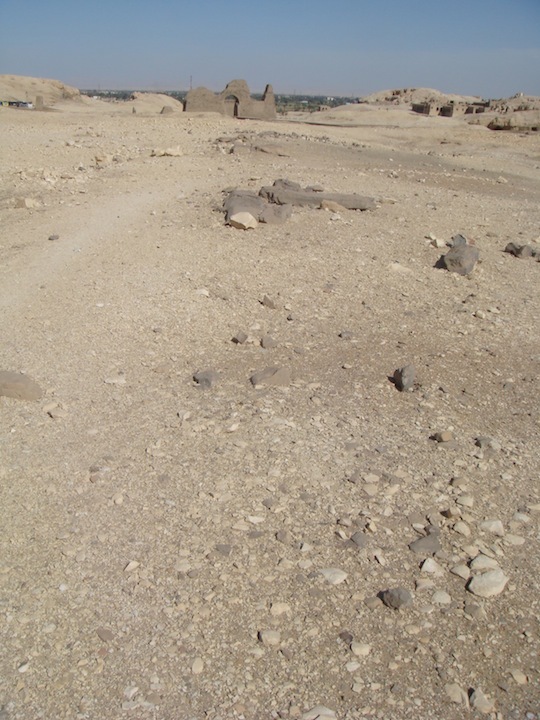 At the top far right you can see in dark shadow the Sheshonq Temple. There you can see the start of the causeway with walls on each side. If you look to the top left you can make out the causeway again. 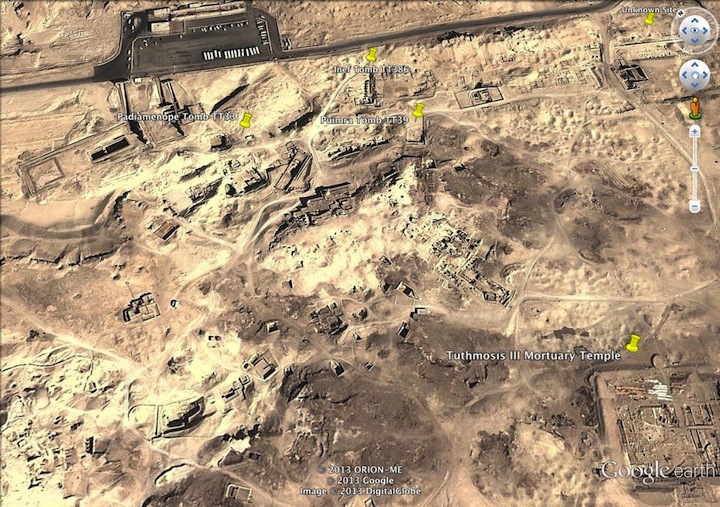 The temple site (in dark shadow) that intersects it is Mentuemhat TT34. Clearly this temple would have been deep under the causeway. On this map I have outlined the possible causeway in red. 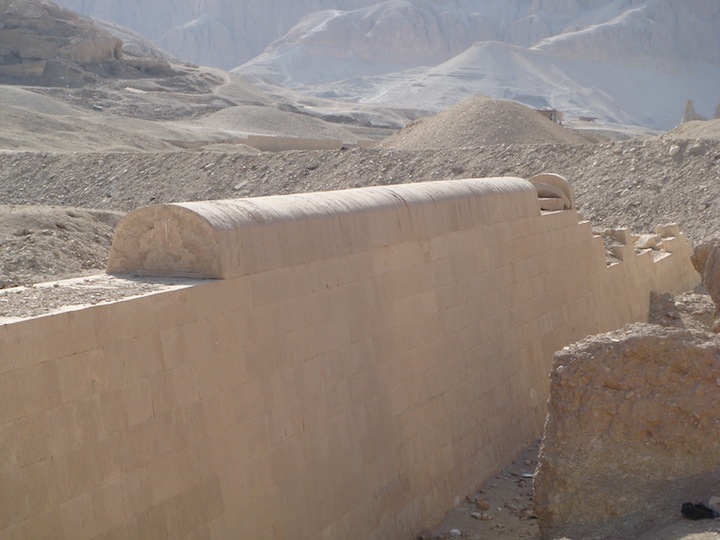 It extends all the way to Hatshepsut Temple. Sheshonq Temple in the distance. The above pictures show what remains of the causeway. Beyond this, east towards the Nile, there is no visual evidence and nothing to be seen across the farmland. I have no information on the site area around where it starts near to the main road. This is my walk along the causeway. 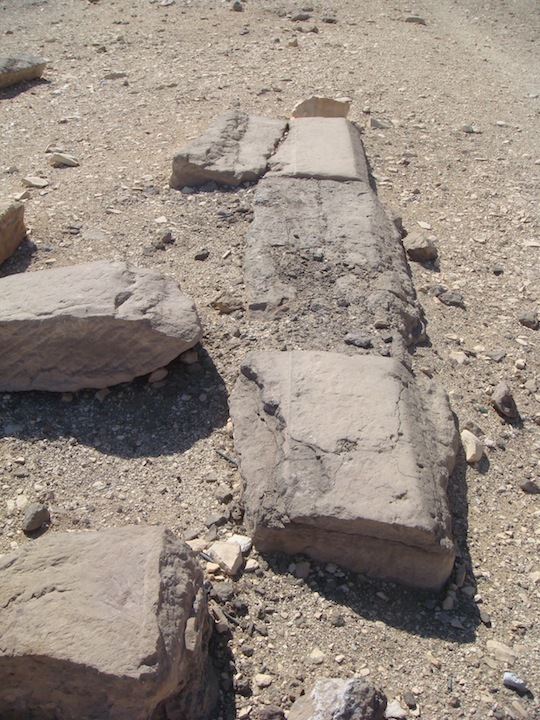 The carved lines in the stone blocks become a symbol of this causeway all the way to Hatshepsut. Looking back towards the Nile. 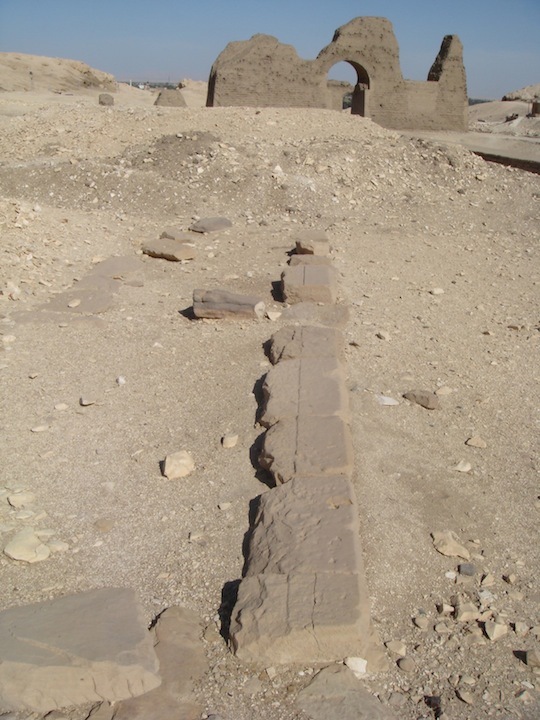 There are the remains of a causeway leading from the temples of Deir el-Bahri and linking them to Karnak. 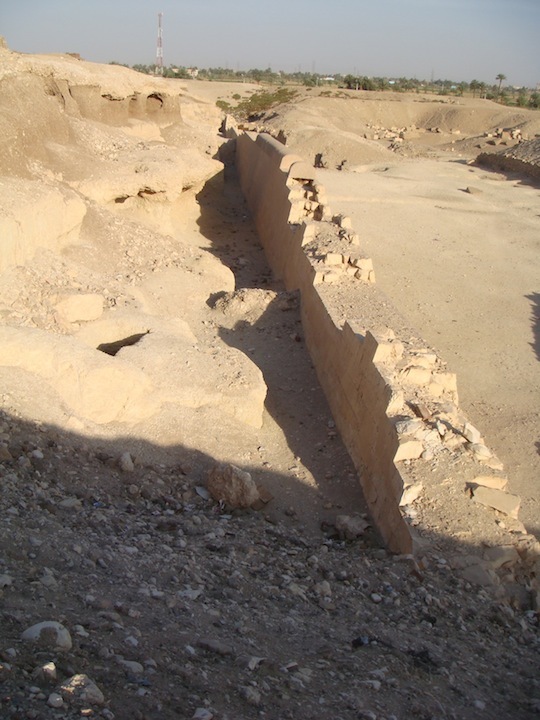 The causeway provided direct access to the area, which was likely used as a staging area for 'The Beautiful Festival of the West' (also known as 'The Beautiful Feast of the Wadi' among other variations). The walled causeway would have linked to a canal or another body of water via a landing station. 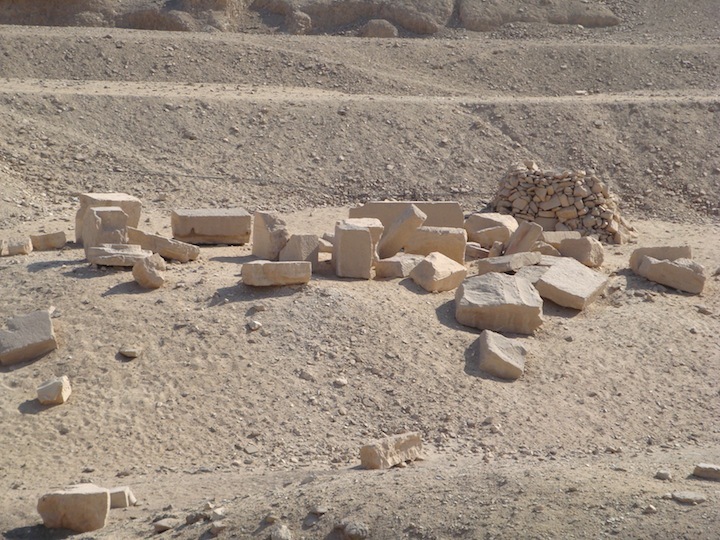 The festival itself was likely an age-old tradition that was probably celebrated in many areas of Egypt. It celebrated Hathor of the West, emerging from the western mountains to welcome the dead into the netherworld. 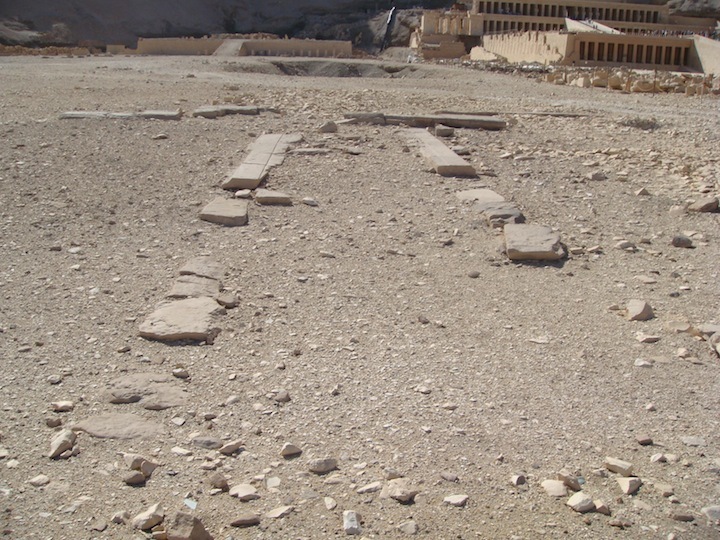 In Ancient Thebes, the festival was celebrated in association with the Amun, whose procession travelled across from the east bank to the mortuary temples in the west. 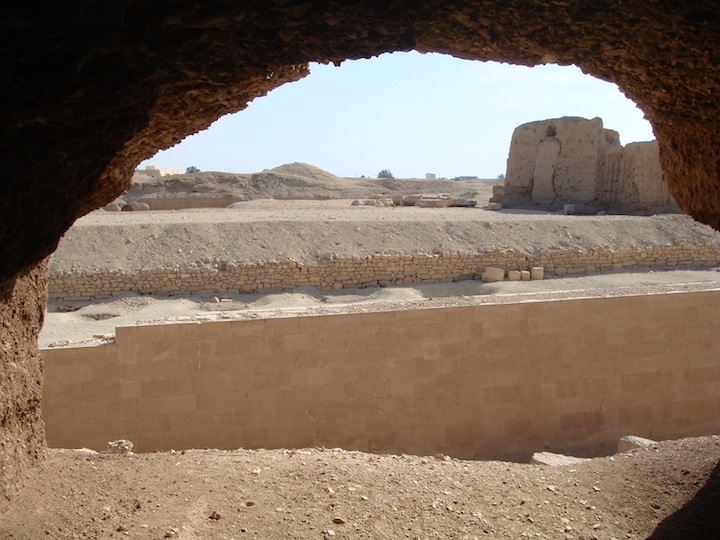 The festival is likely to have begun by the reign of Mentuhotep II of the 11th Dynasty, as his mortuary temple there is a prototype of Hatshepsut's. 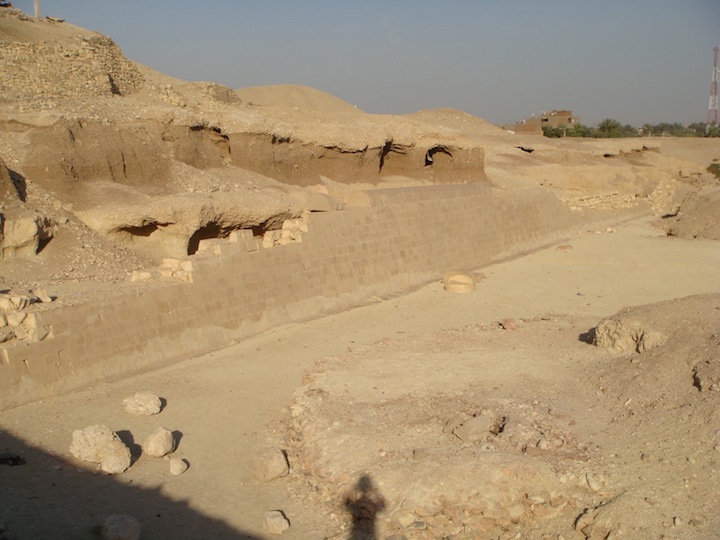 Directly opposite this early Middle Kingdom structure -- on the east bank -- are the mud-brick remains of Middle Kingdom Karnak, indicating the site as a cult centre of Amun centuries before Hatshepsut. 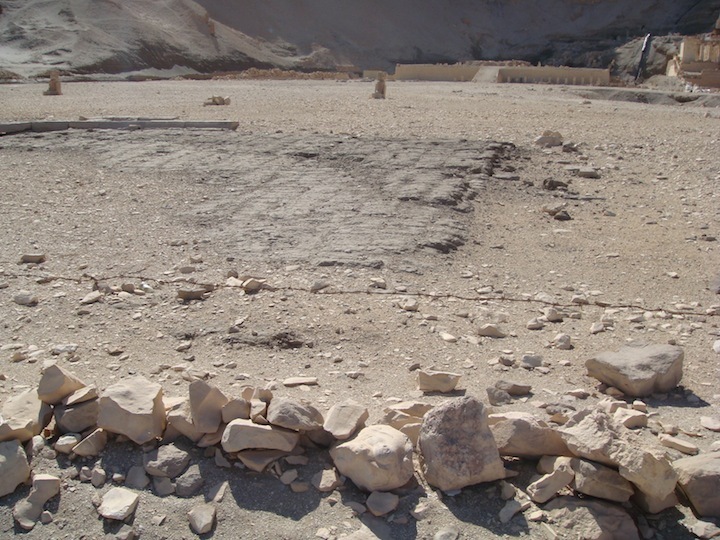 Hatshepsut's temple itself has been argued to emphasise her link with "her father" Amun, therefore legitimising her unusual reign as justified. 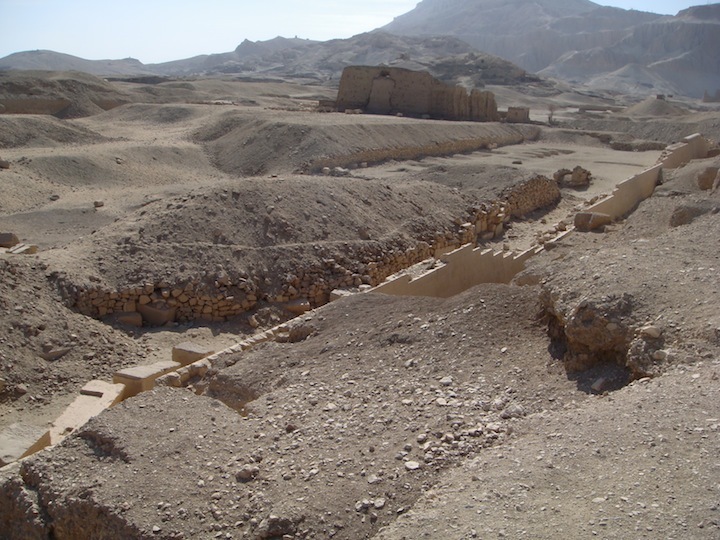 However, the festival procession would also 'stop by' other mortuary temples, including that of Ramasses II and III. 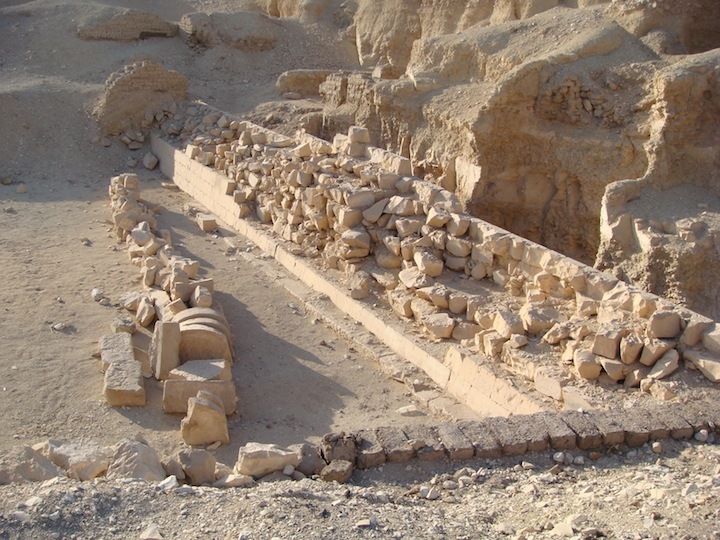 The procession continued until some time in Dynasty 20, when all three temples (Mentuhotep II, Hatshepsut, and the smaller wedged-in temple built by Tuthmosis III) were destroyed by the collapse of the cliffs above.